Trinidad James is doing big thangs! After making it within 10 months, the Atlanta rapper has been an internet sensation with a big buzz getting cosigned from nearly everyone in the Hip Hop industry. The 'All Gold Everything' rapper recently signed a 2 million dollar deal with Def Jam Records and released the first remix to 'All Gold Everything' featuring Bad Boy Rapper - French Montana. 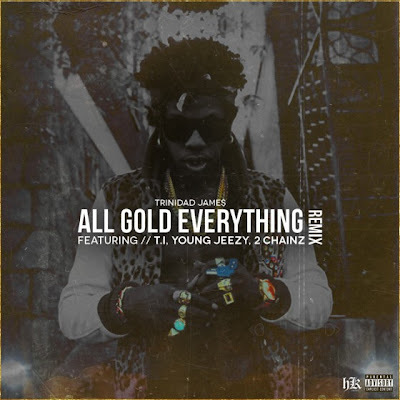 Now, James has released the second official 'All Gold Everything' remix featuring some of Atlanta's finest - T.I., Young Jeezy and 2 Chainz. Producer Diplo let a cat out the bag saying that there's going to be 17 verses on the next remix. I don't know if that's really necessary - but vibe with three of the rappers below.